Near perfect condition. 6 months old. No box, but includes charge lead. Dell Inspiron 13 7000 2 In 1 Laptop Touch Screen. Excellent condition. Never gets used. Battery lasts well over 90 mins when watching football on BTSports. I never used it for anything so I can’t compare. Bought from curry’s. Please look at photo for all the specs this machine has, in case I have listed anything wrong Any questions then please ask. NVIDIA® GeForce® MX150 with 2GB GDDR5. Dedicated NVIDIA® GeForce® MX150 with 2GB GDDR5. DELL Insprion 15 7000 7580, 4.6GHZ 8th Gen i7, 128GB PCIe SSD & 1TB HDD,8GB RAM. Dell Inspiron 15 (7580 7000 Series). Dell Inspiron 15-7000 Gaming 15.6" (Intel Core i5 7th Gen, 8gb RAM, GTX 1050). Barely used and in great condition. I have only used this laptop for 3 months and am only selling because I have acquired a free and better laptop. This laptop is ideal for gaming and can run top range games very well (I ran Fortnite at over 144FPS average). Comes with AC adapter. Manufacturer refurbished. DELL Insprion 13 7000 7386, 4.6GHZ 8th Gen i7, 256GB PCIe SSD ,8GB RAM, WIRELESS. Dell Inspiron 13 (7386 7000 Series 2 in 1). 256GB PCIe SSD. The Dell Inspiron 13 7386 7000 2 in 1. Aluminium case. Simply put, the more RAM you have, the more programs you can run smoothly and simultaneously. SSDs are far faster than regular hard drives. Ingeniously, SSDs don't use moving parts to work, which makes them far more dependable and also quieter. If you require a really powerful, yet portable laptop, then the Dell Inspiron 13 7000 is perfect for you. NVIDIA® GeForce® MX150 with 2GB GDDR5. Dedicated NVIDIA® GeForce® MX150 with 2GB GDDR5. 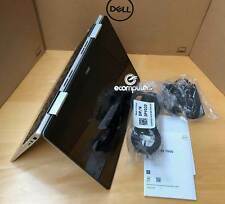 DELL Insprion 15 7000 7580, 4.6GHZ 8th Gen i7, 512GB PCIe SSD ,16GB RAM. 512GB PICe SSD. 512GB M.2 PCIe NMVe Solid State hard drive Faster start-up - Since no spin-up is required. Condition is Used. I have noted there is an issue with one of the hinges. I have included photos with this. although detach it still opens fine and works. Hard drive 128 GB SSD with 1 TB conventional HDD. The 2 x 2 WLAN antenna design provides great range and speed, while Smart Byte Network software prioritize video and gaming content over file downloads, for a smoother experience. 128GB MSATA Solid State Drive 1TB SATA 2.5" Hard Drive 5400RPM (Two Drives). The Dell Inspiron 15-7000 (7560) Laptop. 8GB (8192MB) 2133 MHz Dual Channel DDR4 SDRAM. A 15 " 7000 laptop crafted for compact elegance. Watch movies, TV shows and work on projects in stunning clarity while still having a webcam at the top centre of the screen for added convenience. The Inspiron 13 7000 has a wide viewing angle that allows you to see clearly even if you're not using the laptop head-on, making it the ideal device to watch movies with friends on the go, or working on collaborative projects with your team. Dell Inspiron 15 7000 Series 7548 laptop. The battery needs replacing - see condition report above. It has an US keyboard. I lost the US power cord for a while, so bought another cord in the last year (UK plug, word £35 new). Condition is Used. This item is professionally refurbished. Grade A: Laptop will show very little signs of use, may show minor marks on the lid etc. 1920 x 1080 FHD Display. NVIDIA GeForce GTX 1050. Dell Inspiron 15 7000 Gaming 15.6" 1TB 128GB Intel Core i7 7700HQ, 16GB 1050ti Barely used laptop, had it for editing whilst travelling and ended up upgrading. this is the UPGRADED model with: i7 7700HQ CPU 16gb DDR4 RAM NVIDIA 1050 TI Graphics Card 128gb SSD & 1TB HDD For the spec this is a great price! Condition is Used. Includes Power Adapter. Does not have original box but will be protected & insured. Dispatched with eBay delivery – Shutl 1 day. Dell Inspiron 15 7000. 1920 x 1080 15.6" Display. What is pictured is generally what you will receive. While we endeavour to use pictures of the actual item, this is not always possible when we have more than one for sale. Dell Inspiron 13 7359. Storage (SSHD): 500GB., 1000% Happy With Item. Great service. Quickly resolved 1 small issue. Thx -R1dxn. one rubber foot missing ~. BER (Beyond Economical Repair). Dell Inspiron 13 7000 series. The Dell Inspiron 13 7000 13.3” 2 in 1 is part of our Premium range, which has the latest tech with high end designs. It's a laptop at the office and a tablet on the go, while tent mode lets you view presentations and videos on narrow surface areas and stand mode brings movies to life. So go ahead, finish your novel. Convenient connections: The latest USB 3.1 Type-C port allows universal charging, as well as a DisplayPort for connecting to ultra-high resolution external displays. 3-in-1 SD Card Reader | 2. 4K TOUCH SCREEN--. Also has superb 4k Touch screen with is amazing for watching films,gaming etc. Model: Inspiron 7000. In Amazing condition inside and out Laptop looks Great. Laptop coming with power adapter. The units carry a 3 Months Warranty for Peace of Mind. • RAM: 8GB / Storage: 256GB SSD. With a NVIDIA GeForce MX130 graphics card, the Inspiron 15 is perfect for an handle even the most draining and visually punishing titles, so whether you fancy Minecraft or CS:GO tonight, you can play at full throttle. Dell Inspiron 15 7000 series. The Dell Inspiron 13 7000 13.3” 2 in 1 is part of our Premium range, which has the latest tech with high end designs. It's a laptop at the office and a tablet on the go, while tent mode lets you view presentations and videos on narrow surface areas and stand mode brings movies to life. 8gb i5 7th generation. 500gb hybrid SATA hard drive. Inspiron 17 7000 7779 2-in-1 laptop / Tablet. Ports: 1x USB 3.0, 1x USB 2.0, 1x USB 3.1 Type-C gen 1, HDMI, mic/earphone, SD card reader. Battery: 56 Wh. DELL Inspiron 13 7000 Series 7386. RAM:16GB onboard (DDR4, 2400MHz). Ports: HDMI, USB-C (Display Port), USB 3.1, microSD card, audio jack. Finger print reader. SSD lets you boot programs faster than ever and allows you to load up the laptop in seconds. Lightweight design Lightweight with diamond cut edges, the Inspiron 15 is designed with premium brushed aluminium and magnesium alloy for a contemporary look. DELL Insprion 13 7000 7386, 4.6GHZ 8th Gen i7, 512GB PCIe SSD ,16GB RAM, WIRELESS. Dell Inspiron 13 (7386 7000 Series 2 in 1). 512GB PCIe SSD. The Dell Inspiron 13 7386 7000 2 in 1. Aluminium case. Simply put, the more RAM you have, the more programs you can run smoothly and simultaneously. Inspiron 15 7000 i7 7700 HQ 3.8ghz, 16GB RAM, GeForce GTX 1070, 1TB 128GB SSD. Condition is Used. Dispatched with eBay delivery – Shutl 1 day. Type: Notebook/LaptopBrand: DellProcessor: Intel Core i7 1st Gen. 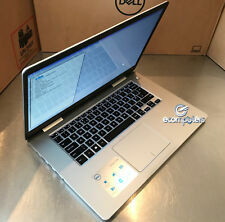 This is a Used Dell Inspiron 15 7000Series Intel Core i7-6500U 2.6GHz RAM 8GB 1T Touchscreen. Please refer to the pictures. This unit has been thoroughly inspected and tested by our in-house, factory-trained technicians. As a result of the technicians' professional handling and care, the unit has been returned to factory specifications. You can expect a fully-functional unit. .
Inspiron 17 7000 2-in-1 7586. NVIDIA GeForce MX150 2GB GDDR5. 16GB DDR4 2666MHz RAM (single stick). In A New Condition. May Have Minor Markings Scratches. 65 Watt AC adapter. 56 Whr (Integrated). 128GB M.2 Solid State Drive 1TB SATA Hard Drive. The Dell Inspiron 15-7000 (7570) Laptop. 8GB (8192MB) 2133 MHz Dual Channel DDR4 SDRAM. Realtek HD. - Fully working, no faults or issues. - 1 x RJ45 Gigabit Ethernet. 500GB SATA 5400 RPM Hard Drive. The Dell Inspiron 13-7000 (7348) 2-in-1 Tablet/Notebook. Switch between laptop, tablet, tent or stand modes to update your blog, edit photos, or stream your favorite shows. Collection station availableType: Convertible 2-in-1 Laptop/TabletBrand: DellProcessor: Intel Core i5 5th Gen.
With dual fans, thermal fins and oversized pipes, you can keep your gaming going for longer with the Dell Inspiron's pro-grade cooling system. Full HD screen Make the most of every film, TV show and photo with the Inspiron's Full HD display. 256GB SSD - Solid State Drive. SSD lets you boot programs faster than ever and allows you to load up the laptop in seconds. Storage: 256 GB SSD. Lightweight with diamond cut edges, the Inspiron 15 is designed with premium brushed aluminium and magnesium alloy for a contemporary look. With such easy set up you can put it virtually anywhere there's a surface – from an office desk to a living room table. The units carry a 3 Months Warranty for Peace of Mind. • RAM: 8GB / Storage: 1TB HDD & 128GB SSD.